Thank you, J. I appreciate you so much, my friend. What a gorgeous painting! I love the blue. It is like a soft blanket of night, and your birdee--so precious--reminding me of something I can't quite name. I love you and your art. And, of course, your poem--a-f'ing-men! love you. Your sweet support means everything to me, Brooke. Thank you for loving me, my art, my writing so tendering, so unconditionally. I'm so lucky to have you right here beside me. Julia, yes to this unapologetic brightness that you display like a bird in all her tender glory! This art, this heart...thank you. And I'm left wondering, why do we hide away this brightness? Are we afraid of being shamed for our imperfections? Worried of judgment and who-do-you-think-you-are? Do we doubt that our brightness even shines because it doesn't look like hers or his? Do we keep forgetting that letting our full brightness shine is gift? ... I love this beautiful bird and the way she is leading me through you. 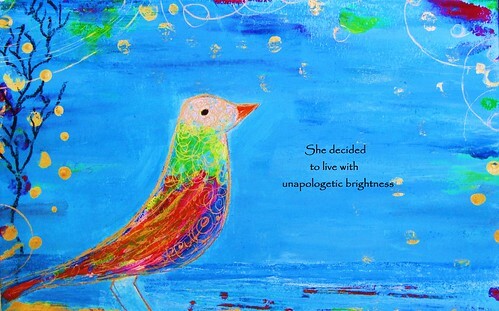 :) And I love your unapologetically bright and beautiful heart. Ashley, It doesn't seem possible that we have just "met," it truly feels like I've known you always, like you've been a part of me for a long, long time. To answer your question, I think it's all of those reasons some of the time and some of those reasons some of the time (and every other combination!). There is no question that shining the fullness of our brightness is the greatest gift we can give...we just need lots and lots and lots of reminders (at least I seem to!). I love that my little bird is leading you somehow--knowing this is just the greatest gift to me. I love your unapologetic bright & beautiful heart too. 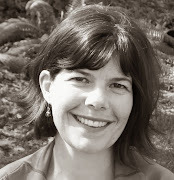 I just recently discovered your beautiful blog. And today I finally had to comment! Thank you for the love and beauty you release into the world with your artwork and your words. Dear Jenna, I'm so happy you decided to leave your words & presence here--you completely brightened my heart by taking the time to connect. I love imagining my words/painting close to you, serving as a reminder to shine your brightness. I send you so much love today. Julia, you are so bright and brilliant, unapologetically shining like the moon and stars and the sun, inspiring the frightened and the weak to come out of the shadows and play. I LOVE this painting and poem. Thank you for sharing it with us. It brought me joy on this cold and grey morning. Leah, your words always leave me wordless...my heart just gets full, so full, and I'm left without a way to express that fullness. I wonder if you could know how deeply you touch others--you have so so much LOVE and I am forever grateful to be on the receiving end of such brightness. "you are so bright and brilliant, unapologetically shining like the moon and stars and the sun, inspiring the frightened and the weak to come out of the shadows and play." The above words made me sob inside. I have been feeling frightened & weak lately and knowing that I have something in me that can help others feel less so, makes my whole life worth living. Thank you for pointing out my purpose so clearly...you can't imagine how much this means to me right now. Love and love and more love to you, precious one. Very inspiring painting. The poem is an uplifting one. It makes me want to reminisce life.